Freshman forward Alonzo Sule scored 22 points, and the Texas State Bobcats won their sixth game in a row Wednesday night with a 61-55 victory over Texas A&M-Corpus Christi. Junior guard Nijal Pearson added 16 points to secure the road win for the Bobcats in Corpus Christi. Jayshawn Talton scored 12 for A&M-Corpus Christi. The Islanders pulled to within two points of the Bobcats with 13 seconds left (57-55) when forward Elijah Schmidt sank a layup. Bobcats guard Tre Nottingham sank four free throws and forced a turnover in the last nine seconds to clinch it. Texas State is off to its best start in men’s basketball since the 1960-61 season. Junior guard Nijal Pearson hit five 3-point baskets en route to 25 points Wednesday night, pacing the Texas State Bobcats past the Rice Owls, 74-60, in San Marcos. Texas State (6-1) has won four straight leading into a Saturday afternoon road game at UTSA. In the game played at Strahan Arena, the Bobcats beat the Owls 40-30 on the boards and made 11 of 27 shots from beyond the arc. Chris Mullins led the Owls (3-5) with 12 points and four steals. Pearson, from Beaumont, will come into San Antonio leading Texas State in scoring at 21 points per game. The 6-5 guard has scored a combined 58 points in his last two games, including 33 against in a 91-68 win at Portland on Saturday night in Oregon. As a team, the Bobcats are limiting opponents to 57.7 points on 37 percent shooting. Keaton Wallace drives on a defender in a Nov. 8 home game against St. Edward’s. Jhivvan Jackson and Byron Frohnen scored 21 points apiece Monday night as UTSA rallied past Houston Baptist, 86-82. Frohnen, a junior from Las Vegas, hit 10 of 12 shots from the floor, scored his career high and led the Roadrunners to their second straight victory. Keaton Wallace had 20 points, eight rebounds and two steals for UTSA. The game was played in Houston at Sharp Gym. Houston Baptist came in with confidence, having knocked off Wake Forest, 93-91, on the road last weekend. Huskies guard Ian DuBose led the home team with 15 points, 10 rebounds and six assists. Benjamin Uloko had 14 points on 6 of 9 shooting off the bench, and 6-10 center Edward Hardt scored 13 for HBU. In a game that went back and forth all night, the Huskies led by six with six minutes left but couldn’t hold on against the Roadrunners, who scored a dozen points in a row to take charge. UTSA hit its season-high in scoring, while shooting 46.8 percent from the field. Frohnen scored 13 in the first half. Jackson, in his fourth game back since returning from a knee injury, was limited to 20 minutes. He scored 15 points in the second half. Jackson has scored 21 in back-to-back games. Wallace hit four three-pointers, giving him eight in his last two. “A lot of these teams have to focus on these great shooters in Keaton and Jhivvan. That just opens up some lanes for me, and I took advantage of it tonight.” — Frohnen told the team’s radio broadcast on KTKR. 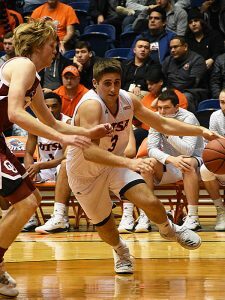 Texas State at UTSA, Saturday, 3 p.m.
Houston Baptist appeared to be on the verge of winning when Oliver Lynch-Daniels drove for a layup and a 72-66 lead for the Huskies with 5:45 left. Not to be denied, the Roadrunners surged 12-0 over the next two minutes, with Jackson scoring the first eight in the run. UTSA point guard Giovanni De Nicolao capped the streak when he sank a free throw for a 78-72 lead with 3:03 remaining. At the end, DuBose drilled a three-pointer to pull the Huskies within two with 8 seconds left. But Jackson was fouled on the inbounds, and he hit two free throws to account for the final points. Northern Colorado guard Jordan Davis arrived at the McDermott Center Wednesday night billed as one of the top offensive threats in the Big Sky Conference. Davis more than lived up to the hype with an all-around performance that lifted the Bears to a 90-64 victory over the Incarnate Word Cardinals. With a quick first step, the nation’s 10th leading scorer made it tough on the Cardinals all night. Not only did he produce 20 points on 7 of 12 shooting, he also grabbed five rebounds, passed for five assists and made four steals. Another Bears’ guard, Jonah Radebaugh, also hurt UIW with 20 points. Radebaugh nailed 5 of 6 three-point baskets. Davis, 6-2, from Las Vegas, came in averaging 24.5 points. Davis seemed to turn up his intensity a few notches near the end of the game. In a sequence of plays that lasted 71 seconds on clock, he drove down the lane for a layup (see video above), assisted on a layup for teammate Jalen Sanders and then threw down the dunk of the night. UIW forward Christian Peevy drives to the basket for a field goal late in the first half Wednesday night. Shooting a high percentage from the field, Northern Colorado surged into a 49-31 halftime lead. The Bears opened on a 14-3 run in the first five minutes of the game. After UIW responded with a streak to trim the lead to 19-13, Northern Colorado surged again, scoring 13 of the next 16 points. After the dust cleared, the Bears held a 32-16 lead. The visiting team didn’t look back, building the advantage to as many as 22 points. Long-distance shooting artist Bodie Hume led the way with 13 points, including three baskets from three-point territory, in the first half. UIW enjoyed perhaps its best stretch of the game in the first four minutes after intermission. Christian Peevy scored seven points in a 14-3 run for the Cardinals that cut the lead to six points. Peevy produced a season-high 26 points on 9 of 12 from the field and 8 of 9 at the free throw line. Guard Augustine Ene was 7 of 11 for 16 points. Northern Colorado did a good job on two of UIW’s primary offensive weapons. Freshman guard Morgan Taylor was held to eight points on 3 of 11 shooting. Senior Charles Brown III was held scoreless on 0 for 5 from the floor. UIW’s defense could use some work before its next game, set for Sunday at Southern Illinois-Edwardsville. The Bears shot 55.6 percent from the floor for the third-highest percentage against the Cardinals this year. Previously, the Montana Grizzlies shot 62 percent on UIW. Texas Tech shot 59.6 percent. Johnatan Reyes, a Northern Colorado sophomomre from Clark High School, contributed a rebound and an assist in 11 minutes off the bench. His biggest impact on the game may have been a large gathering of family, friends and supporters from the local area who were wearing ‘Northern Colorado’ shirts and cheering for the Bears. 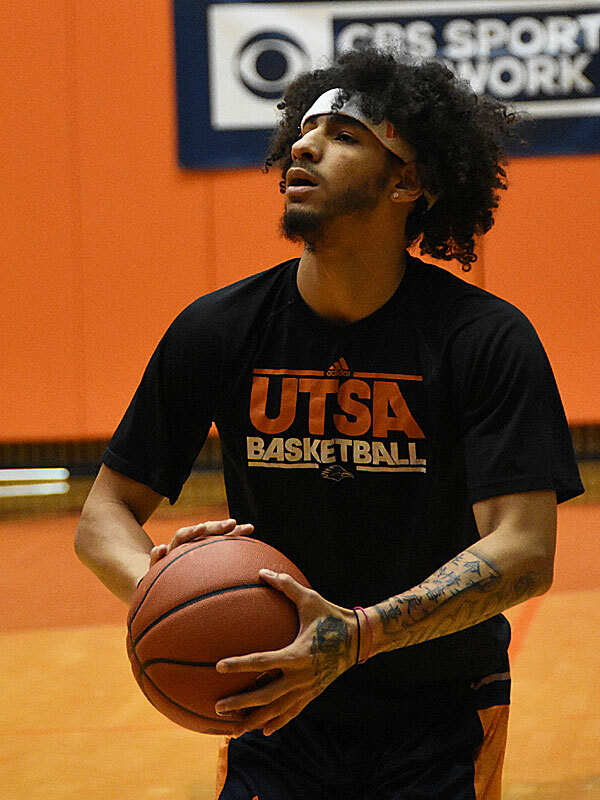 Sophomore guard Jhivvan Jackson scored 10 points in 15 minutes Monday afternoon in his return to basketball for the UTSA Roadrunners. A good sign, indeed, for UTSA. But with Jackson’s playing time limited, the UC Irvine Anteaters held off the Roadrunners 65-56 at the Gulf Coast Showcase. Jackson led the Roadrunners in scoring last year with 18.4 points per game before he went down in late February with an injury to his left knee. The injury knocked him out of tournament play, and it also kept him out of the first three games this season. But after UTSA’s 82-60 loss at Oklahoma State last Wednesday and before the team left for Florida over the weekend, Jackson was cleared to play. Jackson entered the game mid-way through the first half and, in a couple of three-minute stretches, he missed a couple of shots. In the second half, the former standout for Euless Trinity High School and the Puerto Rico junior national team scored on a breakaway layup and a three-pointer to get the cold-shooting Roadrunners moving. Trailing by 25 at one point, UTSA put together a 16-2 run fueled by Jackson and Keaton Wallace to cut the lead to 11. The free-flowing scoring spree was a welcome sight for Henson, whose team had been struggling in losses to St. Edward’s, Oklahoma and Oklahoma State with Jackson watching from the bench. Wallace scored a season-high 23 points, which was likely not a coincidence. With Jackson running the floor and the defense spread, Wallace found his shooting stroke in the second half. UTSA (0-4) plays South Dakota State (3-2) on Tuesday and an opponent to be determined on Wednesday, before returning home. UC Irvine (5-0) is picked to win the Big West Conference. The Anteaters have registered wins early against Texas A&M annd Santa Clara. Jackson initially was credited with 13 points. But the final boxscore indicated he scored 10 points on 3 of 7 shooting from the field. He also hit 2 of 3 from three-point territory. Playing with energy, Jackson had three rebounds, one assist and a steal. Coming into the game, Wallace had made only 14 of 47 from the floor. He was 8 of 16 against Irvine. UTSA’s other four starters continued to struggle. Byron Frohnen, Atem Bior, Nick Allen and Giovanni De Nicolao were a combined 4 for 28 afield. The Florida Atlantic Owls held off Incarnate Word in the second half Sunday for a 71-68 victory in The Islands of the Bahamas Showcase. UIW (4-3) of the Southland Conference trailed by as many as 14 points before mounting a comeback. The Cardinals pulled within one with less than a minute left but couldn’t sustain the rally. Anthony Adger and Jaylen Sebree led FAU (4-1) on the final day of the tournament at Nassau, Bahamas. UIW finished 1-2 in three days of basketball at the tournament. The Cardinals lost 93-66 to Montana on Friday and then rebounded to beat North Dakota State 80-78 in overtime on Saturday. The Cardinals return home to face Northern Colorado on Wednesday night. The Western Kentucky Hilltoppers on Friday night upset the West Virginia Mountaineers, 63-57, at the Myrtle Beach Invitational. Freshman center Charles Bassey produced a double-double with 13 points and 15 rebounds as the Hilltoppers (3-1) advanced to Sunday’s championship game against Central Florida. 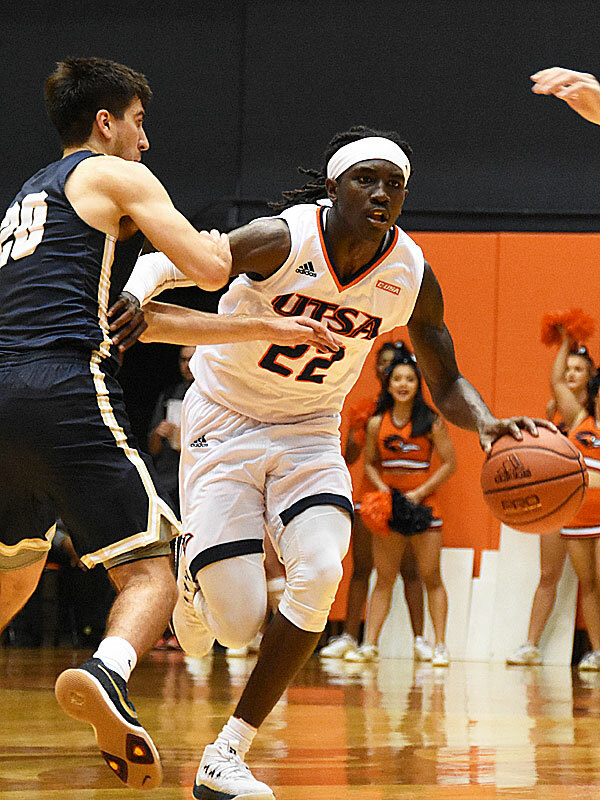 Bassey, a 6-foot-11 native of Nigeria native who played in high school at St. Anthony in San Antonio, keyed a major upset victory for Conference USA by blocking a shot and making two steals. Three Western Kentucky guards scored in double figures, including guard Taveion Hollingsworth with 13 points, Josh Anderson (12) and Jared Savage (11). Forward Esa Ahmad had 12 points and five rebounds for the Mountaineers (1-2) of the Big 12. “You can’t score when you throw it out of bounds 22 times,” he told the West Virginia radio broadcast. Trailing by six, West Virginia made a late charge to tie the game at 57-57 on a free throw by Konate. On the other end, Desean Murray elevated and dunked with the shot clocking winding down to spark a 6-0 run to the finish for the Hilltoppers. Michael Oguine scored a game-high 25 points Friday as the Montana Grizzlies overwhelmed the Incarnate Word Cardinals 93-66 at The Islands of the Bahamas Showcase. On the opening day of the showcase, being played at Nassau, Bahamas, Incarnate Word (3-2) was within 11 points early in the second half when Montana (3-0) scored 15 straight to take charge. Oguine was unstoppable, hitting 10 of 11 from the field and four 3-pointers. The Grizzlies hit 20 of 27 shots in the second half en route to 62.3 percent for the game. Montana’s defense held first-year coach Carson Cunningham’s young Incarnate Word squad to 43.8 percent. Freshman guard Morgan Taylor and sophomore forward Christian Peevy each scored 12 points apiece for the Cardinals. Cameron McGriff, Thomas Dziagwa and Lindy Waters III made sure on Wednesday night that the Oklahoma State Cowboys would not lose two in a row to start the season against teams from Conference USA. After dropping their opener to the Charlotte 49ers, the Cowboys cranked up the offense and pounded the UTSA Roadrunners 82-60 in their home opener at Gallagher-Iba Arena. Oklahoma State (1-1) shook off a slow start, took a nine-point lead at halftime and then shot 62.1 percent in the second half to overwhelm UTSA (0-3). McGriff led the Cowboys with 20 points and 10 rebounds. Dziagwa added 16 points on 4 of 5 three-point shooting. Waters added 14 points, seven rebounds and six assists. Once again, turnovers and poor shooting plagued the Roadrunners, who are playing without injured scoring whiz Jhivvan Jackson. Playing a second-straight opponent from the Big 12, UTSA had 18 turnovers to boost a three-game total to 57. 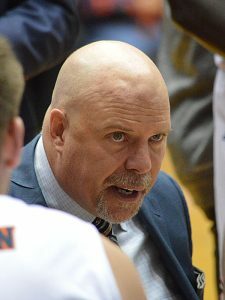 The Roadrunners shot 33 percent from the field. 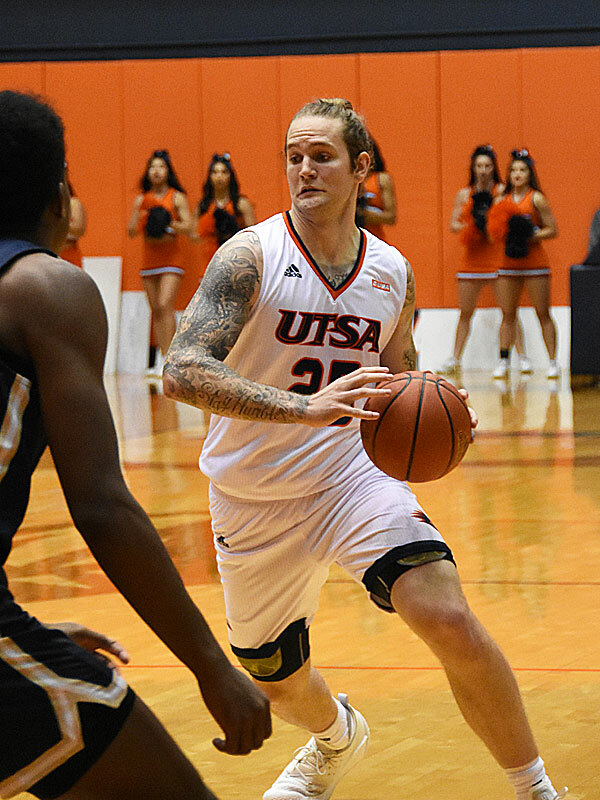 Byron Frohnen led UTSA with 11 points and nine rebounds. UTSA will return home to prepare for the Gulf Coast Showcase in Estero, Florida. UTSA will open the event Monday against UC Irvine. The Roadrunners are scheduled to play three games in three days. Trailing by 10 points in the first five minutes, the Cowboys rallied behind Dziagwa and McGriff to take a 36-27 lead at halftime. Dziagwa had nine points and McGriff added eight points and seven rebounds to erase what had been a 9-0 lead by UTSA. In the early going, Atem Bior had a couple of layups in the first three minutes for the Roadrunners. Nick Allen hit a layup with 14:52 remaining to make it 13-3. “We got to change our mindset. We’re just not playing the right way right now. We love our guys. They come to practice and they’re ready to go. But we just need so much more intensity and … physicality. We got a long, long, long way to go.” — UTSA coach Steve Henson said on KTKR radio. UTSA has lost 19 straight games over the past nine years against teams from the five major conferences, plus the Big East. Oklahoma beat UTSA 87-67 Monday night in San Antonio. The Roadrunners’ last win against a major came on Nov. 15, 2009 at Iowa, when the Roadrunners beat the Hawkeyes, 62-50. Before the national anthem, Oklahoma State paid tribute to two former UTSA coaches, the late Rae Rippetoe-Blair and Brooks Thompson. Both played at Oklahoma State before going on to coaching careers that led to UTSA. Rippetoe-Blair was killed in a motorcycle accident in Austin in 2014. She coached the UTSA women’s basketball teams for 13 years through 2013 and compiled a 216-173 record. Rippetoe-Blair led the Roadrunners to NCAA tournaments in 2008 and 2009. Thompson died in 2016 after an illness. He coached the Roadrunners for 10 seasons through 2015-2016, leading UTSA to the NCAA playoffs in 2011. Attendance at UTSA men’s basketball is notoriously modest. Last year, the Roadrunners won 20 games for the first time in seven years, and the biggest crowd of the season was 2,210 for UTEP. Historically, it’s a considered a good night when 1,200 or 1,300 fans turn out. Last year, the average was 1,146. Crowd watchers will be on alert tonight when the Oklahoma Sooners tip off against the Roadrunners at 7 p.m.
Likely, Oklahoma is the most high profile program that UTSA has ever hosted at the Convocation Center, considering that OU plays in one of the major conferences and only three years ago was playing in the Final Four. “It’s awesome,” UTSA forward Nick Allen said. “It’s a great opportunity for us to show that we can play at that level. There’s not really that much separation between these levels of schools. Allen can’t wait to see what the atmosphere will be like. “It’s going to be electric,” he predicted. “It’s going to be big time. It’ll be a lot of fun. People are going to be really into it. We’re really, really into it. Asked what it would be like to play in front of a full house of people every night, Allen’s eyes lit up. “That would be amazing, he said. “I think that is such an advantage when it comes to any sport. You come into someone else’s home and you feel the energy. UTSA played well against OU last year in Norman, trailing by single digits until the last few minutes. The Sooners eventually pulled out a 97-85 victory. “It was different,” Allen said. “They had Trae Young on the floor, so they played a very different style of basketball. They played very open. The court was very, very spread. OU opened its season with a 91-76 road victory at UT Pan American, while UTSA surprisingly lost at home to a Division II opponent, falling 77-76 to St. Edward’s. Allen said UTSA has been “locked in, really focused” in practices since the opener. “We’re not exactly OK with what happened … it put a little taste in our mouth, and we came to work, so, practices have been really good,” he said. UTSA didn’t shoot the ball very well and, at other times, suffered from too many possessions in which they didn’t get a shot because of turnovers.